Heavy Rain is an interactive story, focusing around the Origami Killer, a murderer wanted for kidnapping young children and using rain water to drown them to death, leaving behind clues to their fathers in order to help them reach their children and testing the love those carry for their own blood. The story starts off after some of those murders were already forgotten, when young Shaun, the son of protagonist Ethan Mars and his wife Grace is kidnapped and put to the same treatment as the kids before him, leaving his parents and the police only a few days to find him, before the water reaches a level high enough to drown him in the well where he was imprisoned. Even though you play as several different characters and take part in their daily routines, the entire plot is centered around the Origami Killer whose actions managed to unite all those people together at some point, each following their own interest. The first protagonist is Ethan Mars, Shaun's father, who has been contacted by the Origami Killer in order to put him to test and see how much he's willing to give up in order to save his son, making him a desperate father always on the run for the next clue that might lead him to his son's imprisonment location; on his tail journalist Madison Paige jumps into the action following him in order to cover her story and fulfil her lifetime dream of writing a novel about the Origami Killer. On the other side you play as FBI profiler Norman Jayden, who has been sent from Washington to assist the local police in finding and arresting the Origami Killer, and Scott Shelby, a private detective hired by the families of the children kidnapped before to put an end to the Origami Killer's streak. 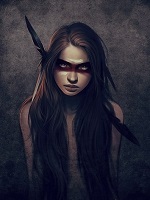 The storyline will have you jumping between those four characters, allowing you to see how things stand from different point of views and also find out more about each one of those characters and see what each one of them is following in the end. Before putting you right in the middle of the action, you will have to go through a series of introductory chapters, each showing off how the characters got into the current situation and what determined them to do their part, and because of that he game will start slow, going through monotone cutscenes and actions, but in the end getting past those moments will pay off as even the smallest detail in a previous event will somehow increase the impact the story has on you and make you better understand why things had to happen. The final hours of Heavy Rain are undoubtedly the best, constantly changing the idea of who the origami killer is that formed into your head and in the end shocking you with the game's denouement, while still making perfect sense and amaze you how the game managed to hide it that well all the way. Heavy Rain delivers one of the best stories any game to day has to offer, but the road to the point where the story picks up and drags you into the experience completely is already half of the game, something that might turn away those always looking for a plot twist, because until the very end the aren't any, but to make up for it the twists that are there are no less than huge and shocking. 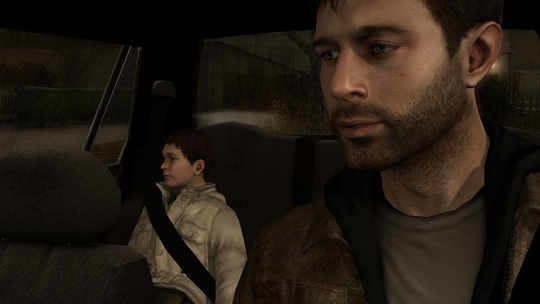 For a game so heavily focused on its plot and the power of the player by choices, Heavy Rain's gameplay manages to keep you with your fingers always prepared for the unexpected, while not getting in the way and distracting you from the story. Most actions will require you to perform different movements using the analog sticks or press and/or hold a series of buttons in order for your character to perform a certain action correctly. Some of those movements are a must while others are there just to give you an option for a perfect play; this happens mostly during quick time events when missing one button will have your character stumbling on an environmental item in their way only to stand up back a second after. 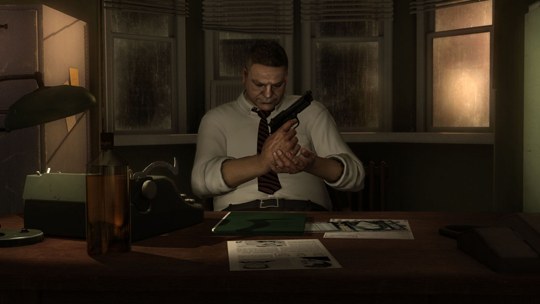 Heavy Rain's gameplay always has a sense of achievement, no matter if it's almost at all times a false one as no matter how right or wrong you got it your character would have probably ended there anyway, but seeing how missing one button will make your character miss a hit or get hit back will motive you to pay more attention further on, making you feel responsible for the success of your character and while it isn't the most entertaining way to take control over his actions, it sure does keep you on your toes. Not all gameplay is based on quick time events however, as certain chapters will give you full control of your character allowing you to explore the environment around you, interact with objects in whatever order you prefer and sometimes even see a few secrets here and there if you look carefully. 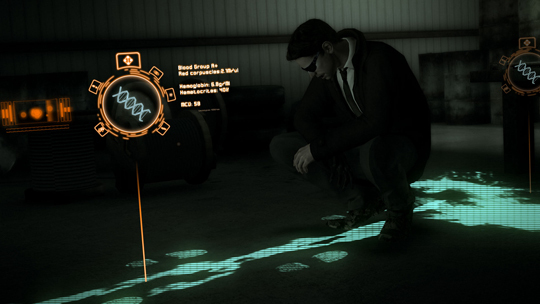 This exploration mechanic is at its full potential during Norman Jayden's search scenes, using the ARI glasses to search for clues around the crime scene, giving you a sense of intuition as to where the next clue might be just by analysing the previous one. The greatest thing about Heavy Rain's gameplay it's that it doesn't disturb you from paying attention to the screen and keeping your full focus on the plot; as long as you know where the buttons are placed on your controller you will never have to think before doing something or taking time to think about what you're about to do, you just perform the actions shown on the screen and when a choice pops up you just choose the one that best suits the direction you want to go with your character and since the game does take your decisions in consideration it's pleasing to see how your choice saved a character from dying or had a major impact on the event that came after. There are scenes when you'd wish you had more control over your character simply because you saw an object of interest in the background and you're curious what's behind or next to it, but aside from that Heavy Rain allows you to look at and interact with almost anything that might be related to your story; even if there are plenty of items that you can interact with, but get no additional information, it would've been nice to have little stories told using those moments and actions that are already there, as for anything else that is directly related to the things you are looking for, interacting with them is easy and feels natural. Heavy Rain looks amazing and the motion capture technology used in the making of the game did a great job of bringing real life actors and their emotion into the game, putting an even bolder mark on the already marking experience. With the exception of a few minor background items such as a crushed soda can that looks like it was brought from a different game due to its lower resolution, everything the characters interact with and see around them look just as splendid. Another remarkable thing is just how varied those backgrounds are; you will never see the same item twice in different places as everything looks unique and in its rightful place. Animations are just as good as everything else, with the exception of a few weird hand movements during certain scenes, but the facial animations sure do make up for it, truly bringing the actors' emotion into the game and passing that onwards to the player. The weather effects, most common the rain, are no less than perfect, adding that special touch to moments when rain is meant to transmit a sad or tragic emotion, making the entire environment more believable. The soundtrack is no less than a masterpiece, having a significant role in the game and the way the characters transmit their feeling to you, always managing to add the right tune at the right time, and combined with some amazing sound effects such as the almost always present rain effect sometimes deliver a heartbreaking experience just by being with those characters in their sad moments and feeling eager to see what is going to happen next and if their situation will improve. Actors Sam Douglas (Scott Shelby), Pascal Langdale (Ethan Mars), Judi Beecher (Madison Paige) and Leon Ockenden (Norman Jayden) do an amazing job voicing their characters and delivering high quality dialogue and monologue lines that will drag the player further into the plot . Some of the secondary characters sound a little bit weird, feeling that the accent the actors used for their voices don't match their respective character, but since most of those won't speak for more than 2 minutes that shouldn't be much of a problem. Heavy Rain can be finished in 10-11 hours, but taking in consideration how much each choice you make can impact the outcome of an event and sometimes even the ending you have plenty of reason to replay the campaign at least 2 more times in order to see everything there is to see. There is no multiplayer or Co-Op mode to tag along some friends for the ride, but each chapter will unlock bonus content in the form of concept art or behind the scenes videos, so for those who want to know how Heavy Rain came to life there is plenty of documentation to look forward to. Heavy Rain is above all, a storytelling masterpiece, managing to tell an amazing and jaw-breaking story from the perspective of four different characters, united together by the actions of one criminal mastermind and giving you the chance to control its ending. Minor issues aside, Heavy Rain is a must play and an achievement in almost every aspect, starting with its spot on presentation of the plot, graphical and audio achievements and intuitive gameplay that adds substance to the already amazing to follow plot.